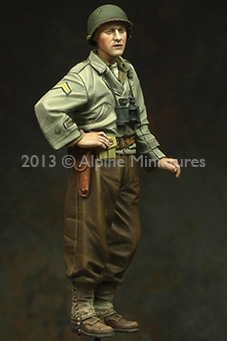 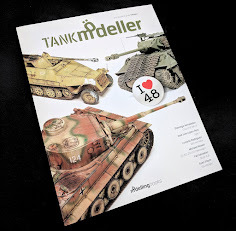 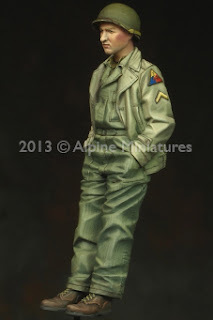 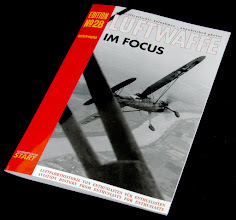 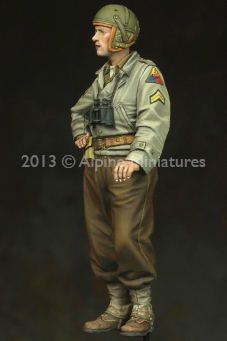 The Modelling News: In Review: Alpine Miniatures "Spearhead" 1/35th scale 3516 US 3rd Armored Division set. 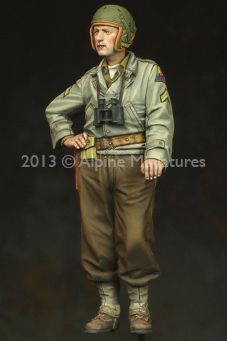 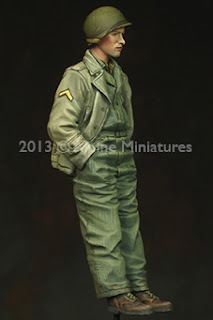 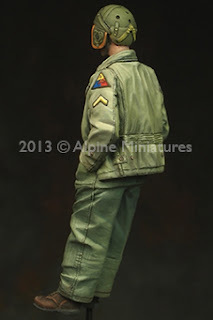 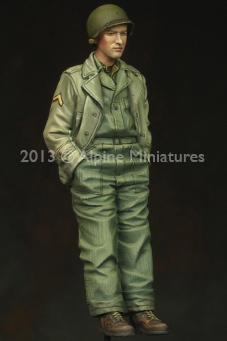 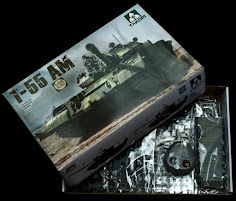 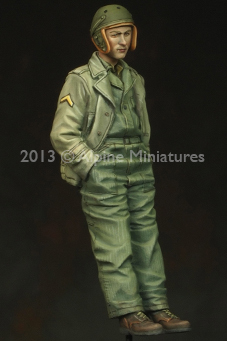 In Review: Alpine Miniatures "Spearhead" 1/35th scale 3516 US 3rd Armored Division set. 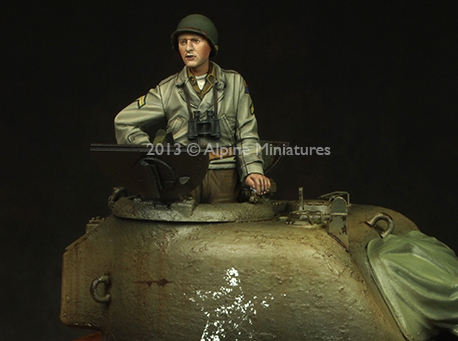 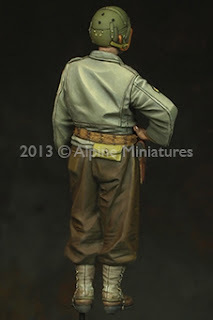 The latest sets from Alpine Miniatures answer the prayers of many who have been braying for more allied figures – there is a set of two soldiers from the famous “spearhead” division – the US 3rd armour in 35th scale. 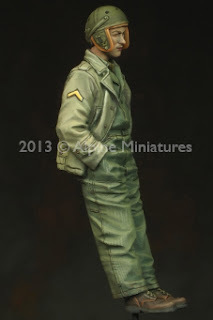 1 figure with 2 different head choices. 1 figure with 2 different heads. 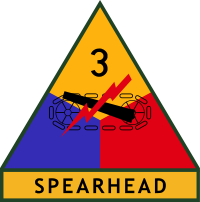 35156 3rd Armored Div. "Spearhead" Set (2 Figures)2 figures, each with 2 different head choices. 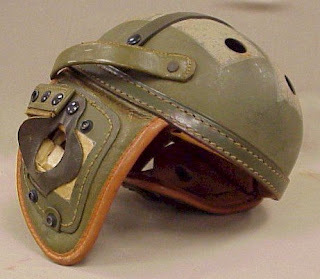 There are two choices of head gear for both of these kits – the heads are the same though both have the choices of a standard M1 helmet or the US tankers soft helmets they used in their vehicles – these were essentially the older style US football helmets adapted to fit the R-14 radio receivers inside them. This helmet is very well sculpted with the straps in the right spots and it really does enforce the view you are looking at tankers. 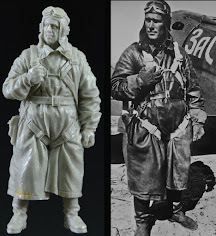 To be honest I would use these as the head choices in both of these figures to differentiate these figures from any other GI’s you have in your diorama. 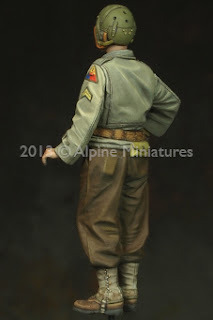 Then again it is great to have the choice and you may want your tanker to look a little different – this was a distinguishing point with American soldiers in WWII – they seemed to have a variety of dress choices and did not stick to certain dress regulations as much as say the British tankers did. 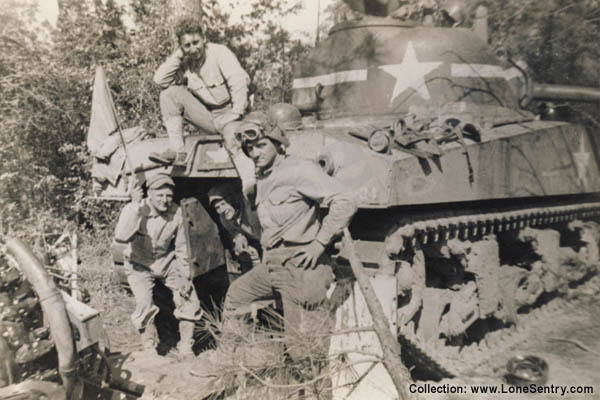 This tanker from Alpine is from the 3rd Armoured “Spearhead” division of the US army during the European campaign in WWII. 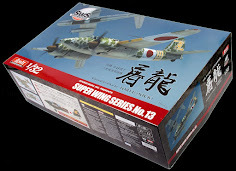 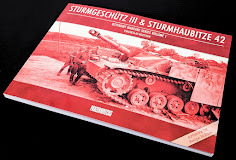 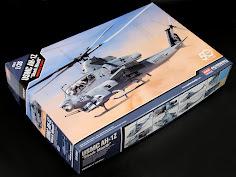 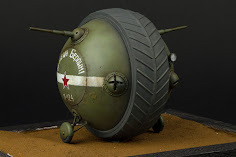 His body language is posed in a “teapot” fashion, with one hand on his right hip with the other resting on something lower, he is seen on the box art resting inside the turret of his tank or beside the vehicle with his right hand resting flat. So you could pose him inside or outside the tank/AFV. 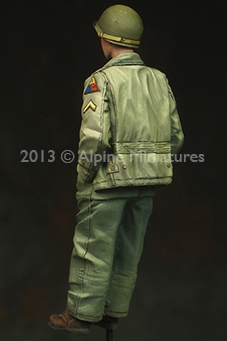 There are lots subtle of elements to his figure Starting from the bottom up this time ill take you thru the sculpt. 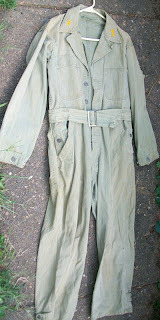 He wears a battle dress woollen OD pants tucked into Type III service shoes and M1938 leggings/galoshes. 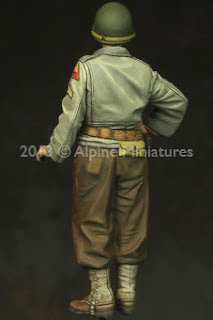 As we look up the figure’s middle half you can see that the folds in the cloth of his pants is very well sculpted and it turns and flops in a natural way - his tunic sits over his waist and it is pinched in by his belt which is worn over his hip. I am impressed by the finely detailed rear pocket flap in his pants on the right side and his belt with it’s thin lines of fabric that is easily distinguishable as well. 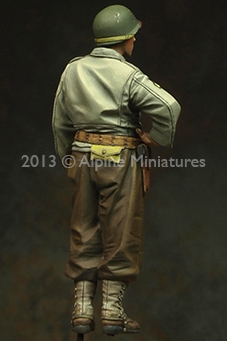 You can see that the tanker has something square in his rear back pocket on the left which is just above and beyond and normally most sculptors wouldn’t think about including – things like this put the quality control and standards laid down by Alpine above most of the pack in resin figures…. 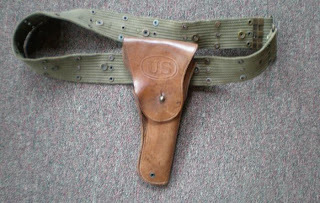 … attached to his web belt is his medical pouch on his rear hip and his standard issue colt 9mm in its US WWII 1911 holster on his right hip (you can see plainly the “U.S.” embroidery on the flap) He has some binoculars attached with a leather strap around his neck with the strap almost looking like it is cutting into his collars. 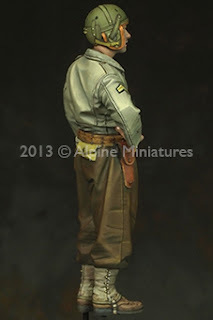 His tunic is open at the front showing his shirt/blouse underneath that is also open showing the two collars around his neck – this is some lovely detailing that has left me really impressed. 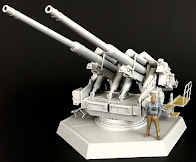 I was equally impressed by the notch for his pistol to sit in - grabbing the torso and also making sure you have correct placement of his right hand - which rests beautifully on top of his hip - this with the arm fitment is just great engineering - well done Teasung. 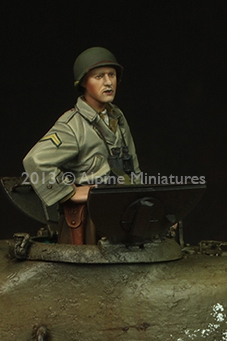 There is a separate casting block containing the two arms and Pistol in the M1911 holster for the tanker’s hip. 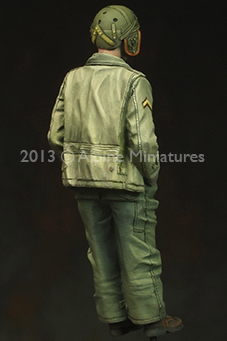 You can see clearly here his 3rd armoured patch on his left shoulder and his corporal stripes just below that. 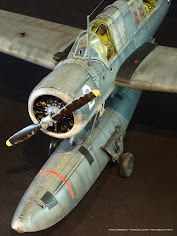 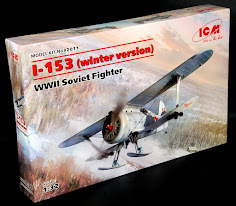 With both of these figures there are cuff flaps and buttons in all the right places and not overlooked as they could be – this is that extra detailing that adds just that little extra to the depth of the figure. 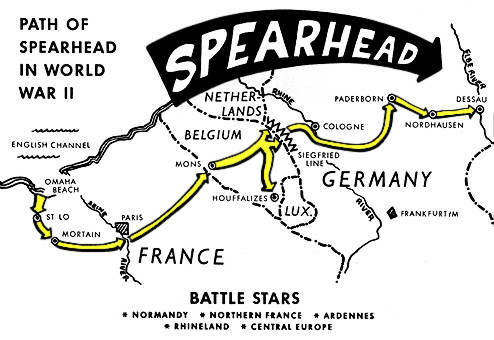 Speaking of heads he has the choice of two here. 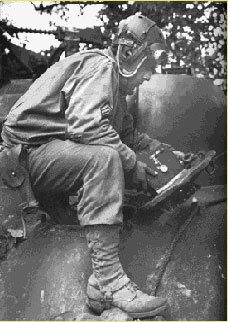 One wearing the standard M1 steel helmet and the other the padded US tanker’s helmet which was a godsend in the confines of the tight vehicle. 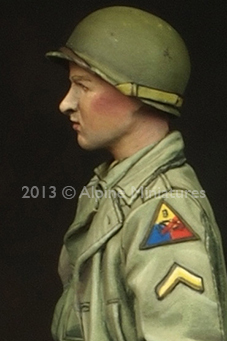 The faces are fairly bare for an alpine figure, and I am not sure what I expect but they come out pretty nicely indeed painted up. Again I am being a bit picky as the faces are plenty detailed and not a lot apart from the eyes nose and mouth with the helmets they are wearing. 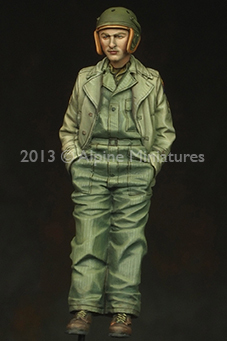 Here he is all together with both head choices in turn. 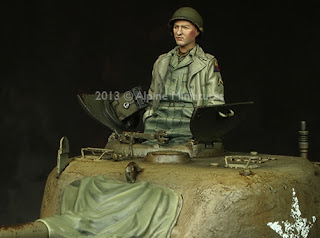 This second soldier in the set from the US 3rd armoured tankers has the choice of two heads just like the first figure. 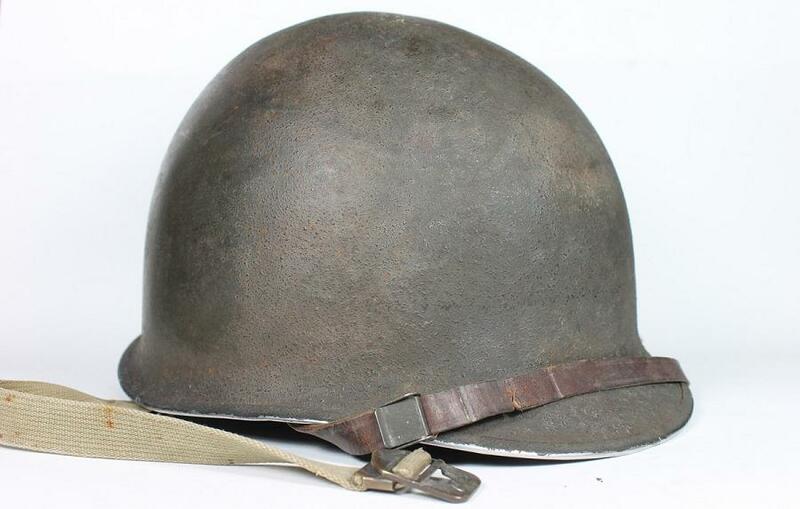 Again the choices are the padded tankers helmet and the steel M1 standard issue. This solder’s facial features look a little slighter than his companion. 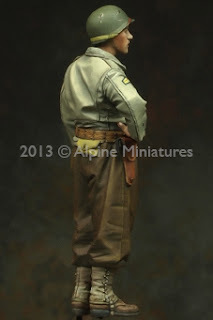 He looks younger than the full corporal he is shoulder with and indeed probably is - as he is a lance corporal. 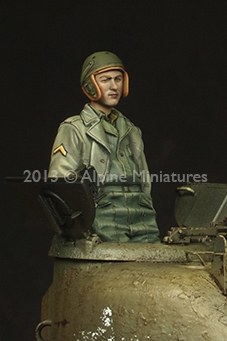 This tanker is wearing a WWII US herringbone twill Tanker's overalls (amazingly painted on the Boxart by Dr Jin Kim in the box art ) with his regulation shirt underneath. 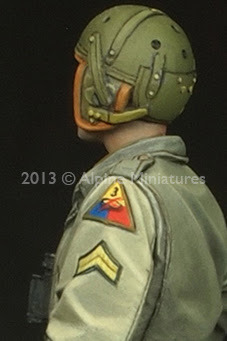 You can see from the one stripe on his shoulders as well as the 3rd armour patch on his left shoulder as well. 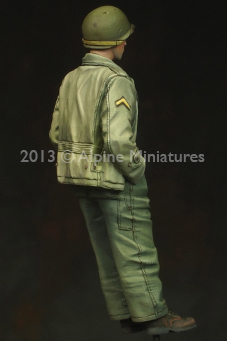 He also wears a half-length coat which site straight vertically down at the correct angle whilst he sits with his feet slightly up. 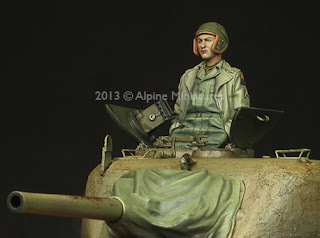 He could be resting in the tank turret or indeed leaning on a vehicle. 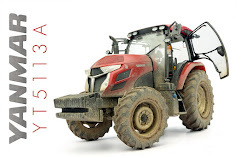 His arms are attached to the sculpt which is unusual for alpine – often they are separate and go in there with some clever engineering – this time things are kept simple but the figure does not suffer from it. 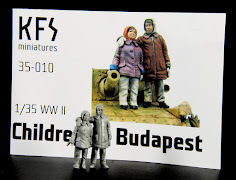 2 figures, each with 2 different heads. When sold as a set these figures come in one box in little Zip-loc bags like they do as a single figure. 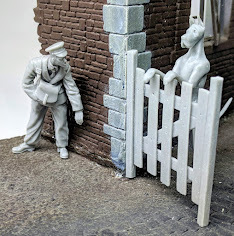 They complement each other as a set rather well I think. 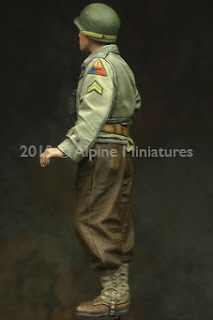 This new set of two individual soldiers from Alpine features two soldiers of the “Spearhead” division of the US army during the European campaign in WWII – these two are shown at rest looking on. 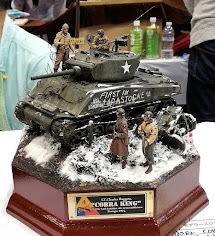 There are four heads to choose from, two each – and they have been painted here by Dr. Jin Kim – quite impressive as a set really. 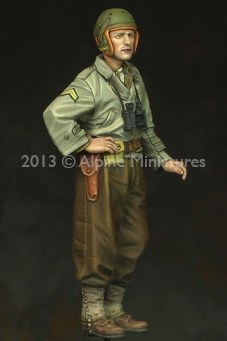 Thanks to Alpine for sending us this set to make - they are now available from: Alpine Miniature’s distributors worldwide. 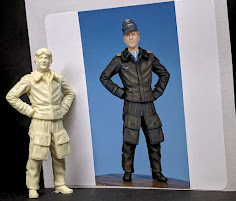 Just quickly I must include the pictures of both of these figures – built up and painted by Dr. Jin Kim who just blew my mind with the great paint job he has done here – very jealous! 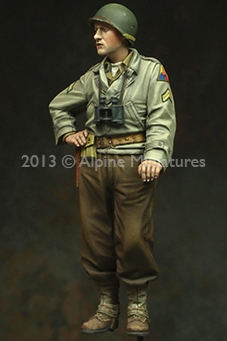 But this is what the base of the sculpt can make achievable.